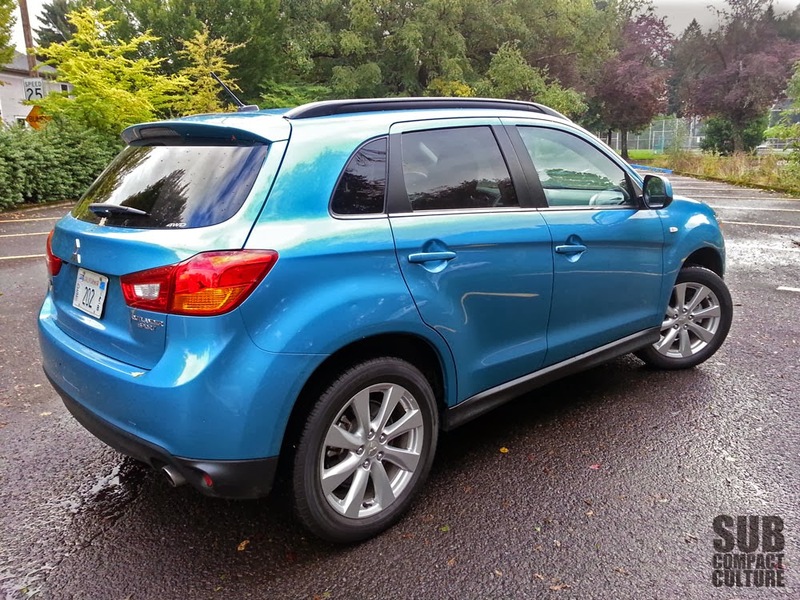 We last drove the Mitsubishi Outlander Sport back in the summer of 2011. We liked it size, its shape, the panoramic roof, and amazing Rockford Fosgate sound system. It lacked power and wasn’t the most exciting to drive. But man, that sound system was amazing. Not a ton has changed for the 2013 model. It still looks good (I love the Laguna Blue paint), it still has the panoramic roof, and still has the amazing stereo. In fact, while the Outlander Sport is perfectly good transportation, I prefer to think of it as one of the best AWD mobile sound systems out there. First the AWD aspect. The 2013 has a newer push-button selectable AWD system. Press the AWD button once to put it into automatic AWD. Press it again, and you’ll be in lock mode, which locks the center differential, thus splitting power equally to the front and rear axles. One more push put it back into 2WD mode. Having owned AWD cars with center locking diffs, it’s a useful feature in deep snow, and even more useful in sand. So if you actually take your Outlander Sport off the pavement or into deeper snow, you’ll know it can actually fair pretty well. Then there’s the sound system aspect. 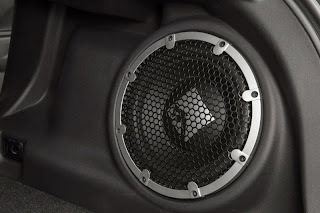 The Outlander Sport has an amazing 710 watt Rockford Fosgate stereo. This must be the loudest factory-equipped stereo ever produced. It’s crazy loud and sounds great. It is complete with eight speakers and a 10” subwoofer, and is truly remarkable. Crank it up—rock, rap, dance, country, whatever—and this thing just gets louder and louder, yet never seemed to distort. Every single time I drove this car during the week, I had the stereo blasting. It’s crisp, it’s clean, and holy mother of God is this thing loud. It's rear-view-mirror-totally vibrating loud. It's waking the neighbors up loud. It's your-wife-and-friends-tell-you-to-turn-it-down loud. I love it. Controlling all this audio goodness is a large LCD touch screen. The last model we reviewed did not have the touch screen, and although operation was straightforward, the touch screen simplifies things quite a bit. Additionally, things such as the climate control knobs feel improved and of better quality than the last model I reviewed. I still adore the panoramic glass roof with the LED accents, too. One thing that bugs me, however, is the switch for the seat heaters. They’re nestled down between the center console and side of the seat, making it difficult to turn on. I can’t imagine fumbling around with gloves on to activate them. Overall refinement levels aren’t as good as a Mazda CX-5, a Honda CR-V, or the Kia Sportage. They’re not bad, but they’re still a half step below the competition, however. My wife thought the interior was a bit bland, and I'll agree with that. But it's functional and doesn't come across as cheap. 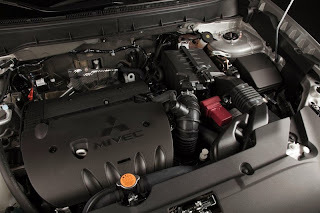 It’s too bad that the ’13 Outlander Sport’s engine and suspension aren’t nearly as impressive as its stereo. The CUV still employs the 2.0-liter four cylinder engine, which makes 148 hp and 145 ft/lbs of torque. It’s not sporty, despite the vehicle’s name. Why this car doesn’t use the 168 hp 4B12 engine found in the Lancer I’ll never understand. Instead, it’s saddled with a raucous mill that never feels like it’s got enough power. And trust me, I don’t need a ton of power (my Suzuki Sidekick puts down about 80 hp to the wheels), but the Outlander Sport feels pokey. Floor it and the engine hangs noisily in the powerband, thanks to the CVT. 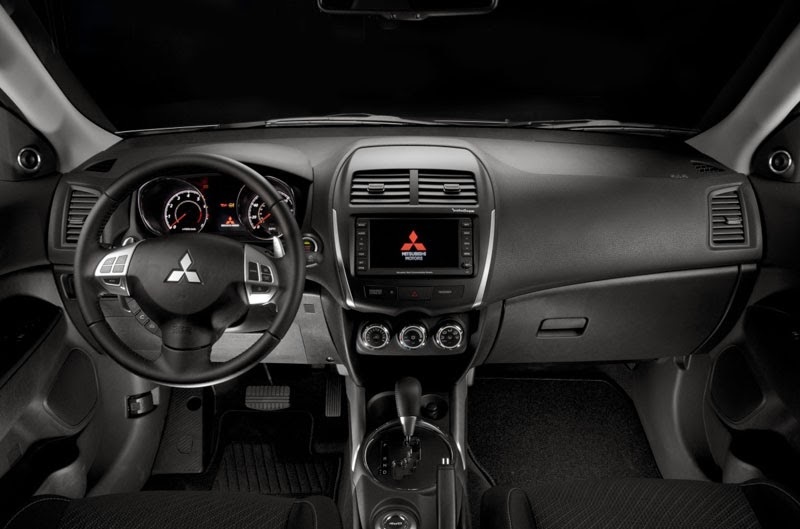 The good news is that Mitsubishi’s CVT is pretty good, especially in manual mode. The paddle shifters are very quick to respond if you choose to shift gears yourself. The EPA estimated fuel economy is 24 city, 29 highway, and 26 combined MPG. We got about 23. Handling felt the same as the ’11 model we tested, and that means an adequate highway ride, but nothing special. One enthusiastic approach into the curves and you’ll remember that this isn’t an EVO, but rather a softly sprung CUV. And while traction surely isn't an issue, body roll is. I love the Outlander Sport’s size. Not too big, not too small. There’s plenty of room for cargo and people, whether in the front or back. The area behind the seats is particularly generous and can easily haul the big Costco runs. Plus, there's a pass-through in the rear seats, and they fold down. The panoramic roof is also still a hit, and when it’s open, it gives the cabin a ton of natural light. 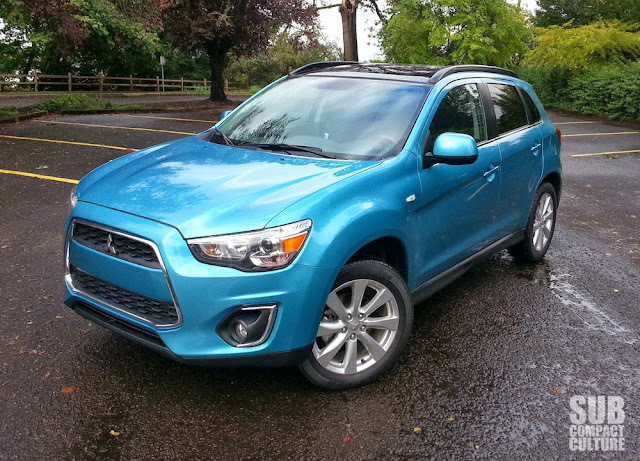 Our test model was a fully loaded Outlander Sport SE AWC, and it came in at $28,570. Yes, it’s got AWD, 17" wheels and tires, a panoramic roof, an amazing stereo, navigation, heated seats, and some other goodies, but that price seems like a bit much. You’re well into Forester XT territory, and that’ll have 250 hp—that's 69% more thrust. You’re also into Honda CR-V EX-L pricing and the farthest reaches of the Toyota RAV4 lineup, not to mention the upper echelons of Kia Sportage Turbos and Ford Escapes. Competition is crazy-fierce in the compact CUV category, and Mitsubishi’s Outlander Sport is a bit out of its league when you option one up. It seemed like more of a competitor to the old Suzuki SX4, though due to its size and power, as it is just a bit smaller and less powerful than some of the other CUVs out there. Regardless, it is still one of the best foul-weather boom boxes you can buy.